There are a few books that one finishes and the immediate thought is when can I read this again. 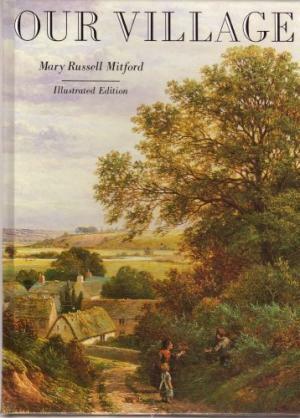 Mary Russell Mitford's sequence of sketches about her village is one of those. This particular edition, introduced by Margaret Lane and illustrated by Joan Hassell, is about the village. This is important to note as Miss Mitford's sketches were so popular that she found herself writing about many other places in the near and not so near vicinity of the village, all under the heading of "our village". But this is the real text. Mary Russell Mitford was a remarkable woman of letters. Her father was a less than admirable character from a Thackeray or Trollope novel. A man who can squander £70,000 in a lifetime in the late eighteenth, early nineteenth century on little more than gambling of various kinds and, of course, personal luxuries must be described as quite remarkable as well. He was clever, selfish, unprincipled and extravagant, with an unhappy love of speculation, and an equally unfortunate skill at whist. He squandered altogether in his lifetime about £70,000 and, finally, became entirely dependent upon his daughter's literary earnings. William Harness, who knew the family well, and was Miss Mitford's lifelong friend, heartily disliked him and called him "a detestable old humbug" but his many failings never succeeded in alienating the affections of his wife and daughter. It seems his highly talented and very hard working daughter adored him and her invalid mother and, apparently, did not mind wrecking her own health by very hard work, writing for money and running a house that seems to have been quite charming and completely insanitary. She wrote plays that were produced in London by and with leading actors such as Charles Kemble and dramatic poetry. But the need to earn money with her pen turned her attention to what became her most successful literary output: sketches about village life. Her inimitable series of country sketches, drawn from her own experiences at Three Mile Cross, entitled 'Our Village,' began to appear in 1819 in the 'Lady's Magazine,' a little-known periodical, whose sale was thereby increased from 250 to 2,000. She had previously offered them to Thomas Campbell for the 'New Monthly Magazine,' but he rejected them as unsuitable for the dignity of his pages. The sketches had enormous success and were collected in five volumes, published respectively every other year from 1824 to 1832. Editions of the whole first appeared in 1843. Miss Mitford and her village became so popular that her house and other landmarks were pointed out by passing coachmen and tours were organized to see Three Mile Cross otherwise known as Our Village. She became part of the literary scene though she stayed in the village with some visits to London. Her health became worse and worse, partly because of overwork, partly because of living conditions and partly because of a series of accidents. After her parents died she removed to a somewhat more sanitary cottage, owned by her friend Lady Russell of Swallowfield Park and continued writing stories, sketches, letters and several volumes of autobiographical gossip, which I shall find and read. Undoubtedly, it will be entertaining. All this despite being partially paralyzed after yet another carriage accident. Our Village is enchanting reading. It is not exactly nostalgic in that a good deal of what she describes is hard living and hard working. It is also life that was already disappearing when she wrote about it (as is so often the case) with spreading industrialization and a growing reluctance on the part of the rural population to know its place in life. But the description of various flower, berry and nut collecting, of the games of cricket, the vivid description of the various characters, young and old, will stay with the reader of these sketches and will draw that reader back again and again.